Pun intended! There’s no doubt about it. Petra is an amazing place. Definitely among the most amazing places on our trip. When you think of Petra, you may envision Harrison Ford and Sean Connery on horse back emerging from a narrow canyon to see the magnificent Treasury. The Treasury is certainly one of the most famous buildings in Petra, but there are many, many more making up an entire city of colorfully carved facades. In its hey day thousands of years ago, Petra was described as a cosmopolitan city full of beautiful buildings, gardens and villas. The Nabateans had moved from their nomadic cave dwelling culture to a wealthy and powerful kingdom popular on the early trade routes. But nothing last forever, and Petra eventually fell into disrepair only to be rediscovered by a Swiss explorer in the early 19th century. Now Petra is a World Heritage site and most recently has been named by popular vote to the New Seven Wonders of the World. It has earned the titles. We spent two days exploring the city. Our legs were exhausted and our shoes full of sand, but the trip there merits long days of walking. The initial walk down the Siq – a naturally formed gorge – is stunning. All the time you are anticipating your first sighting of the Treasury. It doesn’t disappoint. The camels, though touristy, do add ambience. And an odd smell. Provided you are in half decent shape, you’d be a fool to not hike up to the High Place of Sacrifice to take in the views over the whole area. We opted to take an alternate route down the back side of the jebel (mountain) and were rewarded with sites that few tourists venture to see. On our second day we thought we’d change it up a bit and took the “path less travelled” into the city. That’s an understatement. When your guidebook says it’s too dangerous to follow a path during the rainy season, I guess that should be an indication that it might get a little hairy. Especially when it’s a narrow gorge prone to flash flooding and everything that rushing water leaves behind during the dry season. Lucky for us, there wasn’t a threat of rain in the sky. The hike turned out to be a fun adventure of scrambling over boulders and through narrow canyon passages. When we popped out the other side, we came across an excited German tourist who commented that this was better than any of the canyons he’d explored in Utah. Not sure about that, but it was pretty cool. For me, the Monastery was a clear favorite. Perched on top of a mountain with a door the size of a house, it’s an awe inspiring sight. Especially after you’ve made the sweaty hike up to it. Though it’s not as ornate as the Treasury, it’s scale and location make it a highlight of Petra. 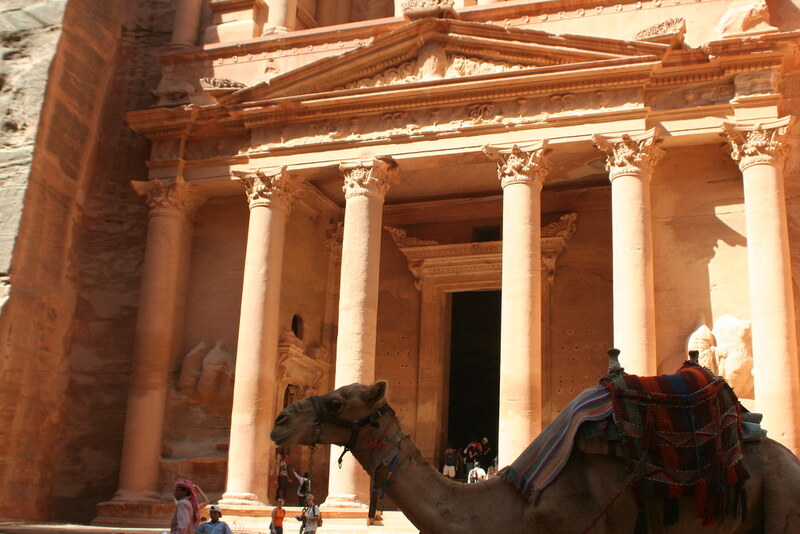 So if Petra is one of those places that you’ve always wanted to visit, then go! Come on. Even Delroy Lindo is doing it!